It doesn’t matter whether they’re beauty-obsessed or just fond of being pampered, the truth is that everyone loves waking up to find a collection of lotions, potions and styling products tucked underneath their Christmas tree. The question is, where are you meant to start? With hundreds of revitalising serums, treatments and mousses vying for your attention, it can be difficult to wade in and start picking products – particularly if your chosen recipient is picky about what they put in their hair. Those of us who don’t know the difference between a hydrating hair mask and a leave-in conditioner have it even harder. Yes, hair and beauty is for everyone, but the terminology used to describe some products can be quite intimidating, and it can feel like people are speaking another language sometimes! To help you make some headway, we’ve pulled together the ultimate Christmas edit, featuring our top picks from 2018. Browsing through the guide below, you’ll find shampoos, conditioners and masks for every hair type, as well as a collection of top-quality beauty products and some fantastic stylers. You’ll also find some specialty products – hand-picked for the beauty addict that’s already got a cabinet full of everyday essentials. 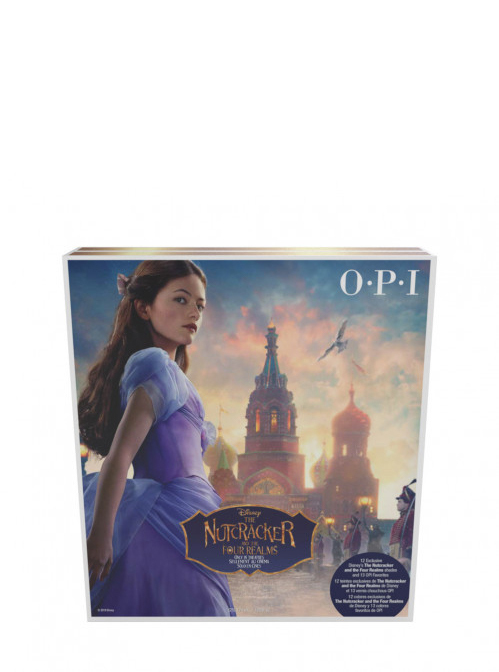 First things first, OPI’s Nutcracker-themed nail calendar is the only way to count down this Christmas. Packed with some truly fabulous varnishes, it’s streets ahead of your average advent calendar and it’s also got bags of universal appeal: teenagers, grownups and everybody in-between will adore the vivid reds, deep purples and frosty, nordic blues. Because its OPI, the varnishes are also incredibly hard-wearing. We road tested a few while we were putting this guide together, and we were impressed with how well they held up to everyday use. We were also really impressed with the intensity of the colours. Even the glittery, pearlescent shades gave full and even coverage, which is no mean feat. Oh, and the best bit? 12 of the 24 nail varnishes are limited edition, which means that your loved one is guaranteed to have some new colours to play with. System Professional’s gift sets are always a real treat to unwrap. They’re also packed with the same, high-performance hair products that our stylists use in-salon, so they’re a pretty safe bet for anyone that cares about their hair. This particular gift set is designed for fine or thin hair, which is actually one of the most common hair types. Alongside a silky soft, hydrating shampoo, you’ll find a deep-conditioning hair mask and a volumizing aerolifter. The repair mask is probably the highlight of this gift set. Its vitamin-rich formula is designed to work its way down into the hair fibre, and repair damaged follicles, which makes it a must-have for anyone with dry or brittle hair. The shampoo and aerolifter are both fantastic products in their own right though. In fact, the hydrate shampoo is incredibly light and wonderfully moisturising, and the aerolifter is a fantastic way to inject instant volume to your style. So, if your buying for someone that’s always striving to add volume, this set is probably the way to go! Both of these products are formulated to repair damaged hair, but it’s the leave in treatment that really steals the show here. Formulated using wheat germ oil and keratin extracts, it’s capable of smoothing over damaged cuticles, and it also provides your hair with all the resources that are needed to encourage new growth. Better still, it provides protection against heat and frizz, making it a must have for anyone that likes to style their hair every day. This gift set looks every bit as luxurious as it’s confidence-boosting counterpart too. It’s the ideal pamper present, and a great way to gift someone the sort of salon-quality hair products that they’d shy away from buying for themselves. 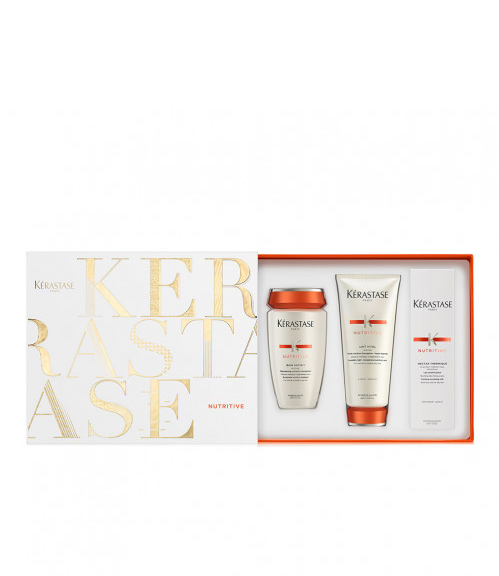 If you’re looking to really pamper someone this Christmas, Kerastase’s Nutritive gift set is a great option. 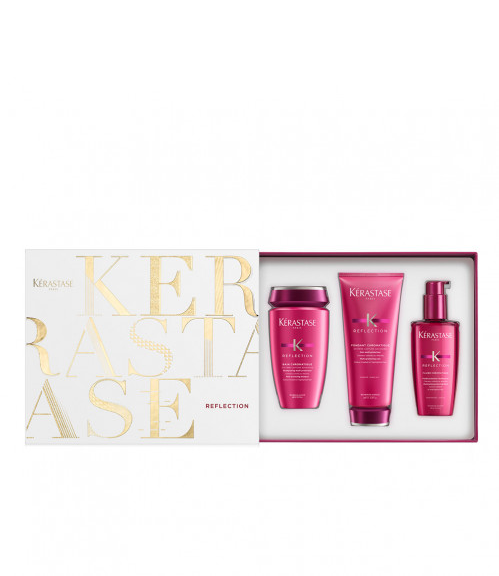 Combining a rich, nourishing shampoo with a restorative conditioner and a salon-quality heat mask, this fantastic boxed set is a real treat for dry or over-styled hair. The Bain Satin shampoo is packed with glucose proteins and a special, Irisome complex that’s designed to leave your hair feeling smooth, soft and irresistibly shiny. The Lait Vital conditioner is also designed to nourish hair from root to tip – which we absolutely love – and the heat mask provides a glossy sheen that looks spectacular, as well as protecting hair from further damage. All in all, the complete gift set contains everything you need to nourish and repair damaged hair, which makes it a great choice for anyone that’s fashion forwards, or over-fond of the hairdryer. Combining three speciality products that are formulated to enhance and protect colour, this gift set is a must-have for anyone with colour-treated hair. Slide off the lid and you’ll find a high performance shampoo, conditioner and hair mask nestled together. The shampoo itself is a marvel of modern science – combining refraction-enhancing rice bran oil with chelators, UV filters and vitamin E to protect coloured hair from heat, light and oxidative damage. 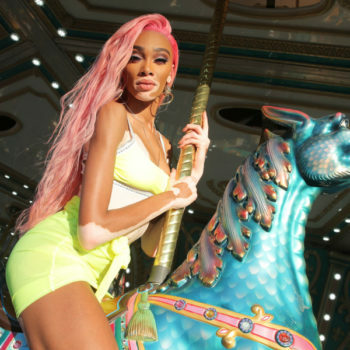 The conditioner is also designed to restore vibrance, while the weekly hair mask is designed to soothe and protect hair follicles, keeping coloured pigments locked into the hair’s cortex. Used in combination, these three salon-quality products will protect and enhance coloured hair. They’ll also leave hair feeling soft and silky smooth, which makes this gift set another brilliant pamper present for those of us with colour treated hair. 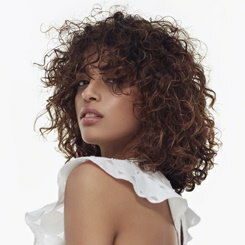 Moroccanoil have spent the last ten years perfecting some truly unique treatments, and their hair and beauty products are always a safe bet. In fact, there are few brands that we trust quite so readily, and we’ve yet to find a single Moroccanoil mask, treatment or shampoo that didn’t blow us away. This attractive, ice-blue tin contains three of brand’s best-loved products: A moisture-repair shampoo, a hydrating conditioner and a fantastic hair mask. All three of these high-performance products have been formulated to deliver a healthy dose of keratin, argan oil and fatty acids – allowing them to soothe dry hair and lock in moisture. They’ll also leave your hair feeling soft, shiny and smooth, which is no mean feat in the middle of winter! 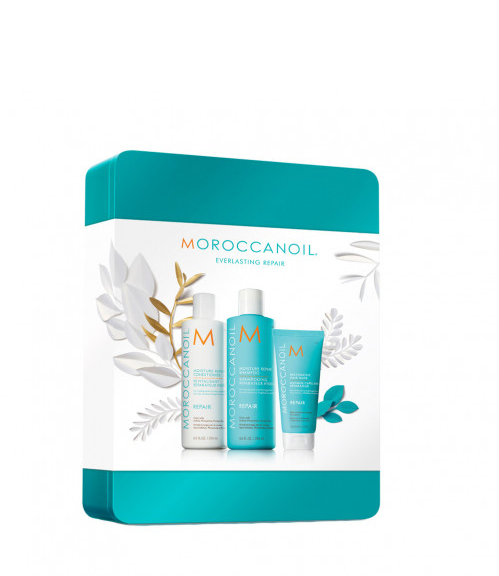 Because they’re produced by Moroccanoil, all three of the styling products included in this tin are also infused with the brand’s trademark scent, which is reminiscent of tropical beaches, luxury spas and childhood vacations. So if you know someone that would love to escape to sunnier times, this gift set is definitely for you! Red algae might not sound like something you’d put in your hair, but trust us, it really does make a world of difference! 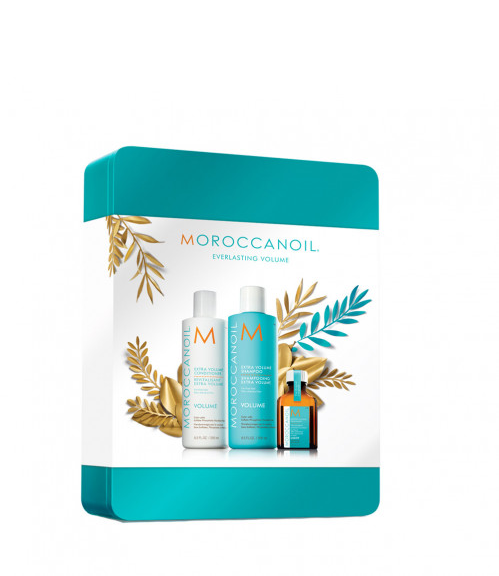 This beautifully packaged gift set contains three salon-quality hair products that combine red algae with vitamin A, vitamin E and Moroccanoil’s trademark argan oil to heal and nourish dry hair. There’s a hydrating shampoo, which is gentle enough for use on coloured hair, and a hydrating conditioner that’ll add bounce and shine to weather-damaged locks. There’s also a handy, travel-sized bottle of the brand’s flagship hair treatment that can be applied on the go so that your chosen recipient can always add lustre and shine to their hair. 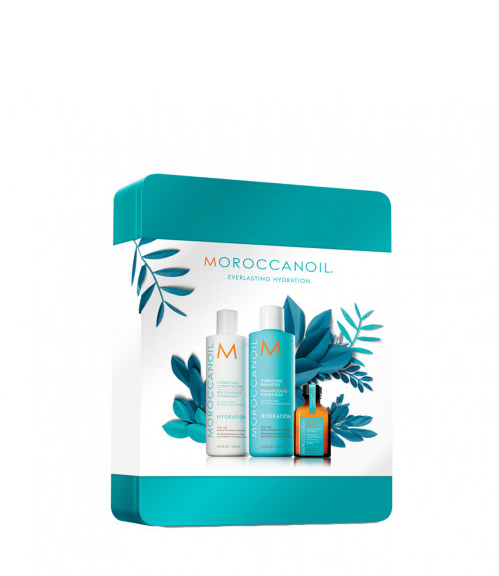 Like all moroccanoil products, the contents of this gift set are sulphate and paraben free, which makes them a great option for people with sensitive or dry scalps. More importantly, all three products look and feel incredibly luxurious, which is why we couldn’t resist adding this fabulous gift set to our edit. Know someone that struggles with thin or lifeless hair? If so, why not give them the gift of volume this year? Combining two salon-quality care products with a light hair treatment, this beautifully-packaged gift set is a great way to help them nourish their hair and boost their confidence. Inside, you’ll find a salon-quality shampoo, a brilliant conditioner and the hair treatment we mentioned above which is designed to add lustre without leaving any residue. As you’d expect from a Moroccanoil product, the shampoo is incredibly high-performance, using Tilicine and argan oil to reach deep into individual hair cuticles and pump up the volume. The conditioner is great too. It’s a lightweight formula, which means that it won’t weigh your hair down, and it’s designed to add movement and lustre, which is great if you’re battling flat hair. It’s great to see that both of these top-quality products are paraben (and sulphate!) free too: We hate recommending products that might cause adverse reactions, and it’s always nice to be able to say that something is genuinely suitable for all hair types. If you know someone that would appreciate a little lift, this boxed set is a sure thing. Struggling to find gifts for the fashion-forward man in your life? You’re definitely not alone. A lot of brands are so focused on female hair and beauty that they forget to produce gift sets for men, leaving you scrabbling around to create a DIY combination of salon-inspired shampoos, conditioners and masks. And that’s a shame, because a lot of men would be thrilled to receive a slick and sophisticated care box, packed with salon-quality products designed to up their hair game. Luckily, TIGI have stepped up to the plate and put together the ultimate men’s gift set. Combining a nourishing, basil mint shampoo, a hydrating conditioner and a high-performance wax, this handy little box contains everything that’s needed to overhaul their morning routine. The individual products are all great options too: The shampoo is lightweight, and contains both lemongrass extract and sunflower seed oil. It cleans and hydrates hair without leaving build-up or residue, which is essential if they’re going to use styling products. 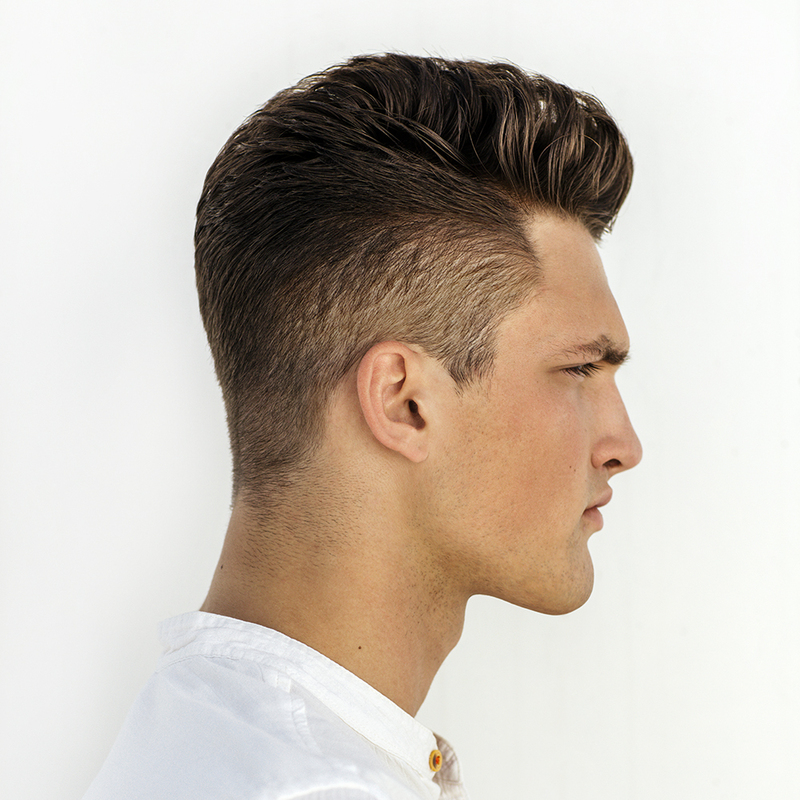 The conditioner is also a great buy – providing a cocktail of vitamins, proteins and plant extracts that will nourish, energise and reinvigorate his hair. Oh and the wax? It’s a unique formulation that contains beeswax and glycerin, which means that it’ll last all day, and wash off without leaving a residue. 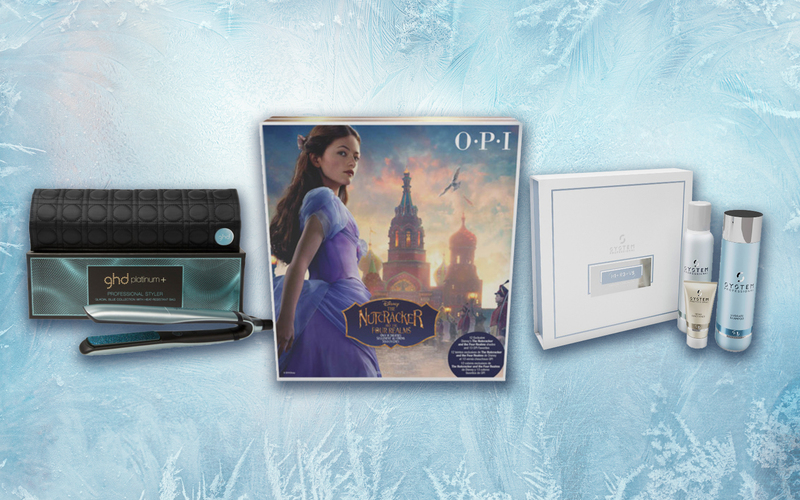 Nothing says Christmas quite like a pair of brand-new glacial-blue ghd platinums. These sleek and sophisticated straighteners have been given a winter makeover, boasting a brand-new frosty blue outer casing and a pair of glimmering styling plates. These cutting-edge straighteners are still packed with all the ground-breaking technology that you’d find in a regular pair of ghd Platinums too: they use a suite of powerful microprocessors to maintain even 185C heat, and they also have automatic sleep functionality so that you never have to worry about burning the house down. ghd’s Platinum+ stylers also make use of a special ultra-zone technology to track the thickness and texture of your hair, so that you never have to worry about heat damage. If you’re buying for someone who styles their hair everyday, these straighteners are the ultimate gift. 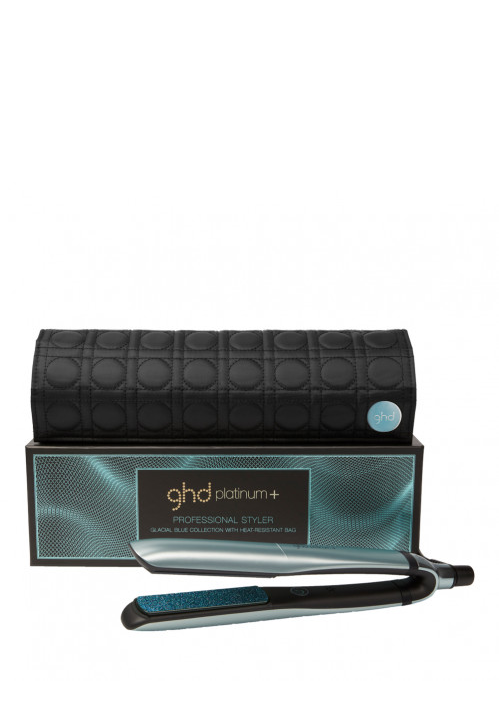 The Glacial Blue ghd Air is another top buy for style addicts. This hairdryer is streets ahead of the competition, and we absolutely love the fact that it’s capable of giving a salon-quality finish every time. Under the hood, the Air boasts advanced, ionic technology that’s designed to control flyaways and frizz, plus a ‘cool shot’ button so that you can lock down styled hair with a blast of cold air. Even better, the Air packs a 2,100w salon-strength motor that pushes out high pressure air at an incredible 22.3 m/s. In real terms, this means that the air will dry your hair twice as fast as a comparable commercial hair dryer, and with less damage too. 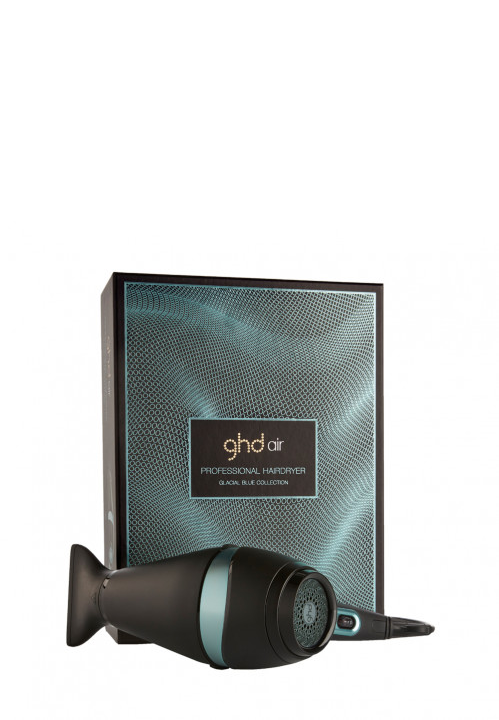 As with all ghd products, the Air also looks the part. It’s sleek, sophisticated and instantly-recognisable – particularly in glacial blue. Even the box feels expensive, which makes it a perfect gift for Christmas 2018. 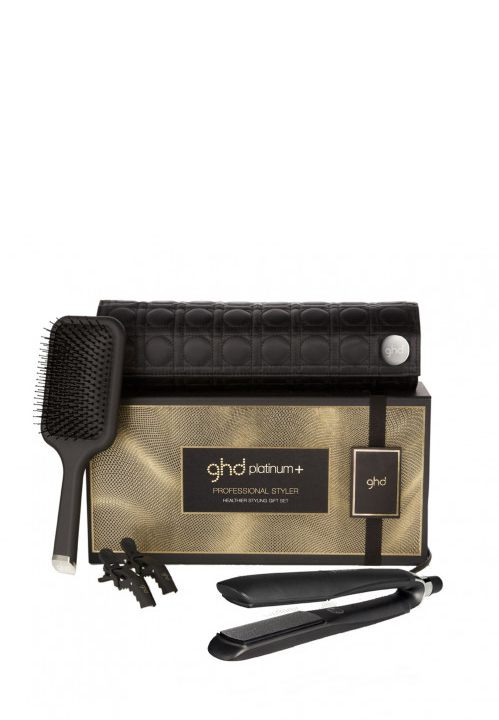 If you’re really looking to spoil someone this Christmas, ghd’s Platinum+ gift set will be hard to beat. This fantastic collection of the styling tools includes a pair of ghd Platinum+ stylers, an ergonomic paddle brush, two sectioning clips and a heat-proof roll bag. 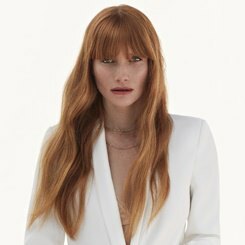 The straighteners are definitely the highlight – boasting precision milled styling plates,a unique, wishbone hinge and powerful ultra-zone technology that checks on the temperature of your hair 250 times per second – they really are some of the best stylers you’ll find on today’s market. They also heat up in under 25 seconds, and deliver a smooth, sleek finish every time. The brush is a great little tool in its own right: its flat – which makes it great for styling large sections of hair – and it’s been designed for use in salons, so you know it’s one of the best paddle brushes you’ll be able to lay hands on. Plus, everything comes packaged in a beautiful box that’s made for gifting. If you’re looking for ultimate hair and beauty gift set, this may well be the option for you.